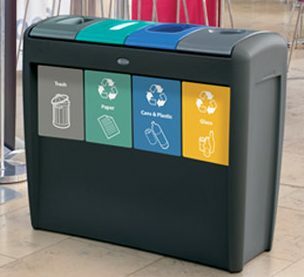 by Brianna Crandall — April 12, 2019 — Glasdon, a Richmond, Virginia-based supplier of commercial waste management products, released two new collections in its portfolio of waste and recycling receptacles in recent weeks that are designed to be stylish, versatile and durable additions to a variety of modern commercial environments. Entirely customizable, from aperture color to waste type, Glasdon’s innovative Nexus Transform is a stylish, robust and versatile multiple-waste-stream recycling station. 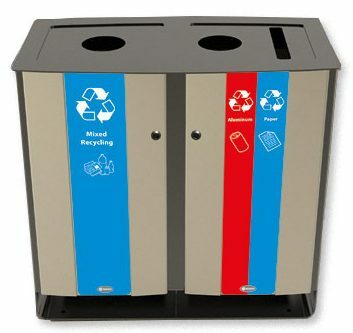 Choose from a multitude of colors, sizes, configurations and over 50 apertures, including cup recycling and even confidential waste, to fit your exact waste management requirements. A narrow footprint makes Nexus Transform suitable for a wide variety of environments, such as malls, educational campuses and offices, where floor space is at a premium. Its contemporary, symmetrical design also allows it to be approached from both sides in more open spaces. Decals are easily applied onto either of the Nexus Transform’s large sides for added personalization. Further flexibility is added with an extensive list of optional extra features, from wheels and lock kits to sign kits and aperture connector kits. We’re very excited about the launch of Nexus Transform. It’s set to become one of the most versatile recycling solutions on the market. With so many flexible options, our customers can choose their own configuration, colors and decals to best fit their needs. What we have found is that our customers’ recycling needs are transforming, and this product allows our customers to adapt to those needs. For information about the Duo Unit, Trio Unit, Quad Unit or Cup Recycling Station, visit one of the Nexus Transform webpages. Designed to complement the aesthetics of modern environments, Electra stainless steel recycling bins are a contemporary development of the classic metal recycling bin that can help facilities managers (FMs) create a sleek and practical waste management program. Glasdon says that the Electra bins strike a balance between eye-catching aesthetics and long-lasting durability. Electra products are manufactured from an Armortec- coated steel framework and 100% recyclable Vandalex body panels. These environmentally friendly, robust materials help to provide a long service life, as well as ensuring corrosion and maintenance are kept to a minimum. Both the Electra 48 Gallon Duo Recycling Station and the Electra 48 Gallon Trio Recycling Station are suited to a wide range of locations: colleges, retail/commercial developments, transport hubs and architectural business spaces, to name but a few. Flexible siting options are also available for Electra recycling stations, including a freestanding kit or a concrete fixing kit. Electra recycling containers are supplied as standard without any decals, allowing FMs to style the unit however they wish using Glasdon’s extensive range of recycling decals. Placing color-coded, full-length decals on the front and rear panels and on top of the containers helps passersby easily identify the intended waste stream of the bin. You can also opt for screen-printed apertures to reinforce the color scheme of your recycling program, and to encourage participation. Electra bins can also be personalized with your company colors, logos and branding. Glasdon says its team of graphic designers offer a free in-house visualization service, allowing you to see exactly how your design will look before committing to an order. For more information about the Electra stainless steel bins, visit the Glasdon website.